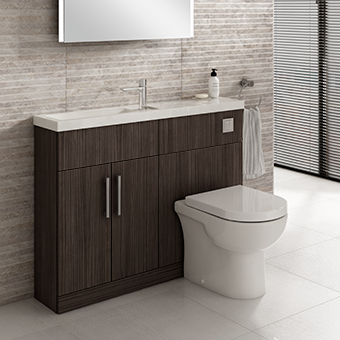 Zaneti is a well known brand from Q4 Bathrooms, over the years the range has grown, with an array of stunning bathroom furniture, from 600 Wall Hung Basin Units, to Tall Column Units. The Slimline Unit and Cloaks Unit are one of the latest additions to the family. Both Units are perfect for saving space, if you have an under the stairs WC with not much room or a cloak room with just enough space, the Cloaks Unit is ideal for both.The Cloaks Unit measures 840mm high, 400mm wide and with a depth of just 220mm it can fit in to most spaces. The Slimline Unit is also ideal for saving space with a depth of just 260mm. 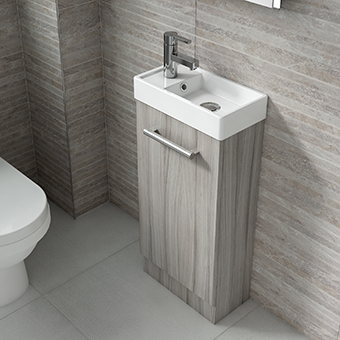 This unit hosts more storage space than that of the Cloaks Unit, and is more ideal for the smaller bathroom rather than the under stairs WC. All five colours are available in the Slimline Unit and Cloaks Unit, if its a wood effect that you’re looking for, Urban Grey and Driftwood, or if you’re wanting a high gloss finish, Tespesta Grey, Slate Grey or Gloss White have it covered. Offering high quality, lasting products is important to us. All products from Q4 Bathrooms come with a 10 year minimum guarantee. Have a look at our Zaneti Furniture range to be inspired.